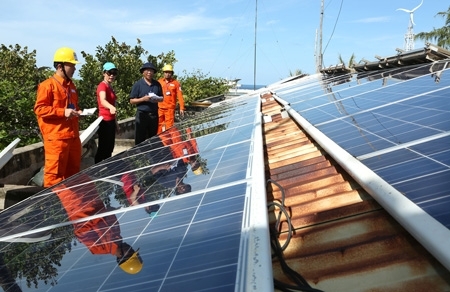 The central coastal province of Khanh Hoa is striving to bring the solar power plants in its territory to operation in 2019, according to local authorities. The province is now home to nine projects of this kind, with a combined capital of 13,020 billion VND (over 563.20 million USD) and a total capacity of 565 MW. They are built on a total area of nearly 800 hectares, scattering over the province. The provincial People’s Committee recently announced that it has publicized a list of some 30 places covering more than 2,100 hectares for investment studies for solar power projects. Among the places, 22 have been registered with a combined capacity of 1,200 MW and are waiting for approval from the central authorities, and the rest are calling for investment. Khanh Hoa province has a natural area of over 5,190 square kilometers, with an annual average of 2,600 hours of the Sun and an annual average temperature of 26.7 degrees Celsius. Cam Ranh city and Cam Lam district in the province are described by experts as the most suitable places for developing solar power generation.